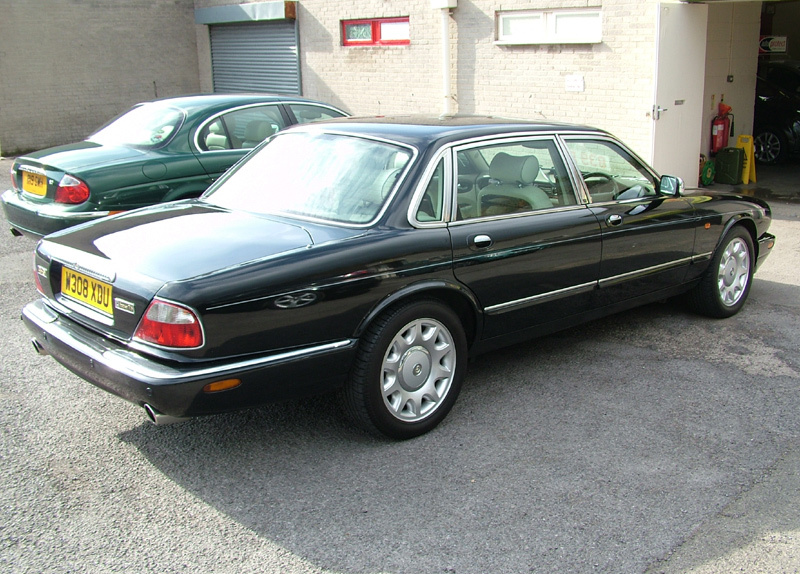 Although I loved my 3.2 XJ8 - which has been a wonderful car in all respects and certainly good value for money at the age I bought it, I thought that someday I might treat myself to what must be the ultimate version of the 308 - the Daimler Super V8. 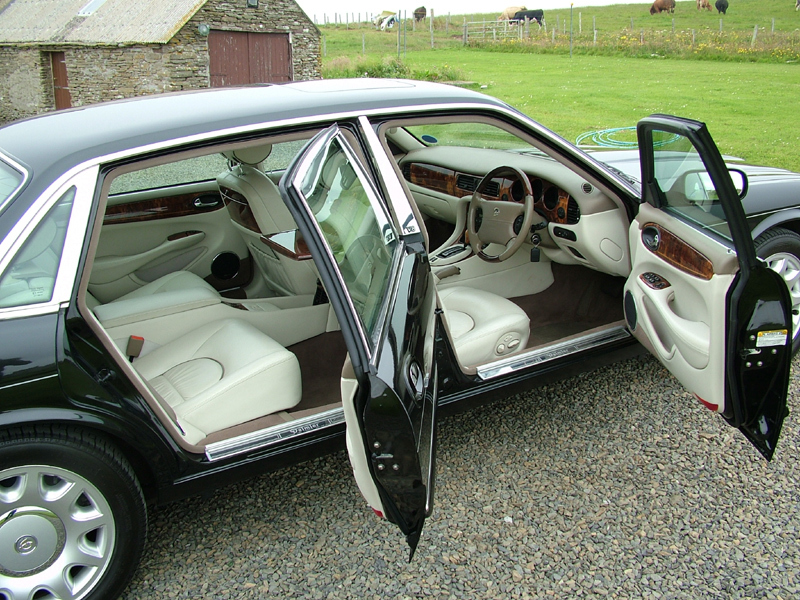 These were generally bought by companies for their CEO's and many were chauffer driven for titled owners. 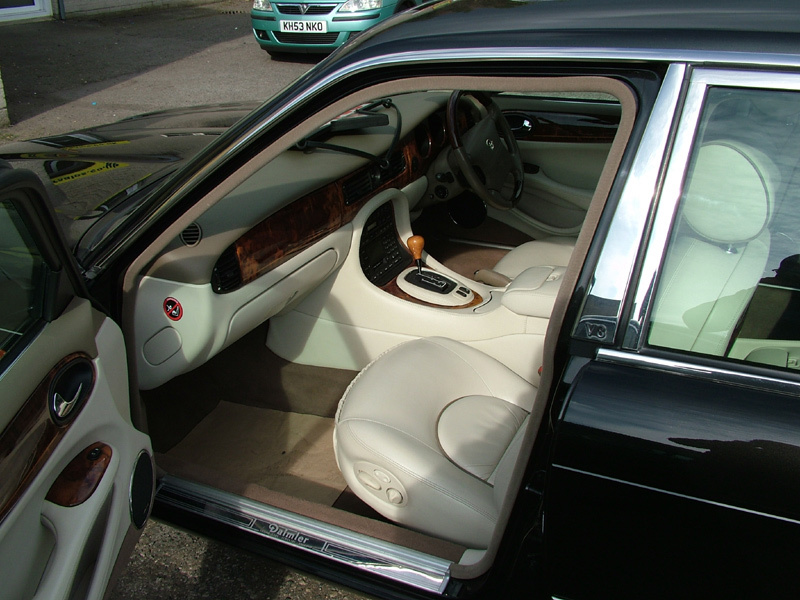 HM the Queen had a 2001 model specially built for her - including a bespoke handbag rest on the centre console. I was never, and never will be, in the league of people who splash out over 66 grand on a car, but I do know quality when I see it and now that the price of these cars has dropped like a brick on the surface of Jupiter, I thought it was about time I took the plunge before they are all high mileage scrappers in need of extensive (and expensive!) restoration. 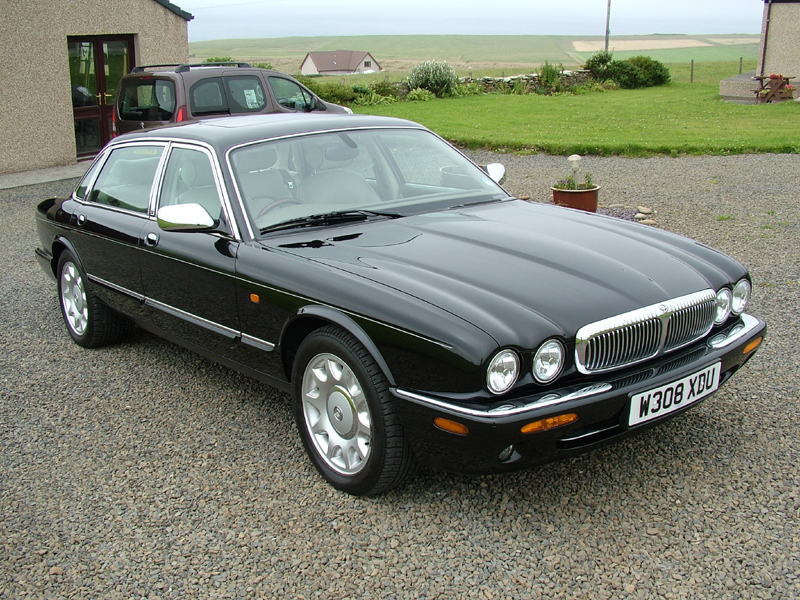 Another important factor was that there was a chap in Orkney pestering me to sell him my XJ8 - always the best time to sell anything. 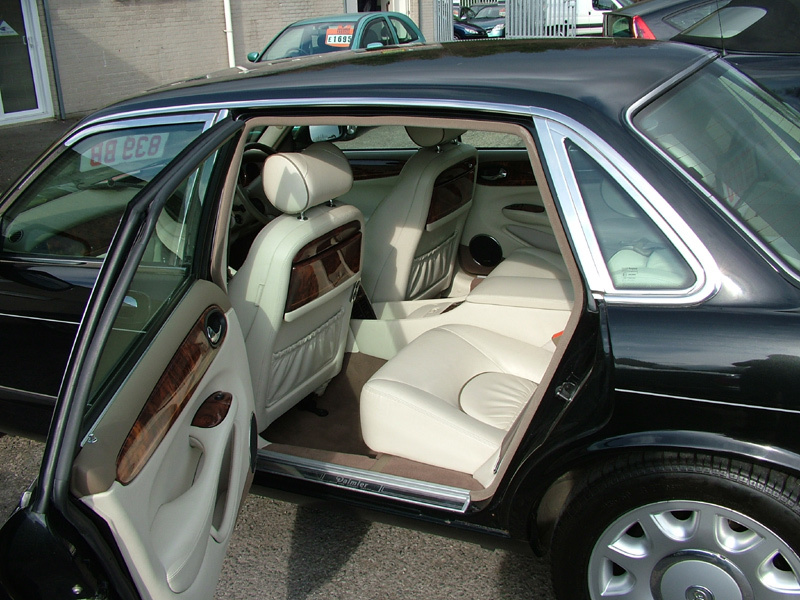 The car I eventually settled on is a May 2000 metallic black/ivory leather version with picnic tables, embossed headrests and 4 electrically adjustable heated seats with the command panel between the rears. Needless to say it is absolutely fully loaded and everything still works. 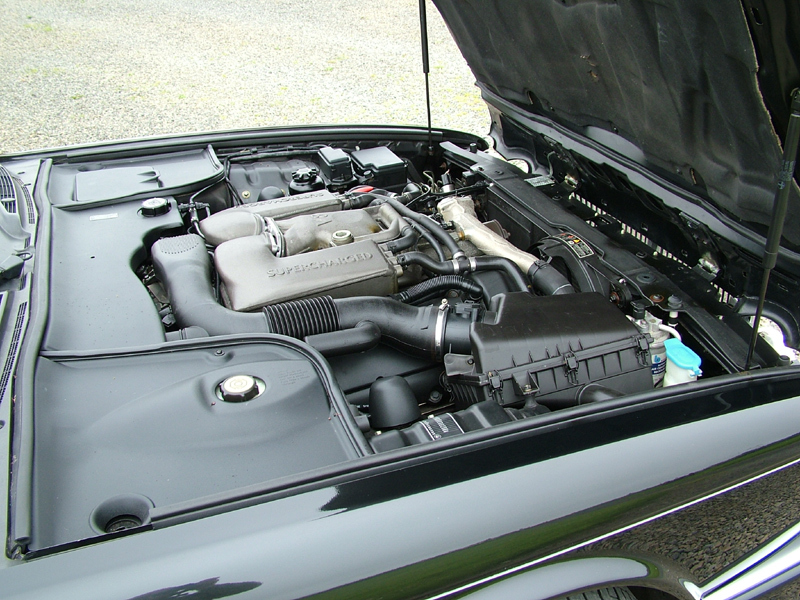 Being a 2000 model and supercharged it has the steel linered engine and the Mercedes derived 5 speed auto box. It is not totally without fault - it is after all 14 years old, but the minor parts needing attention are few and will be dealt with in due course. So far it has no issues around the strengthening plates behind the front dampers, the rear subframe is excellent and the sills are showing no signs of problems. As soon as practical, I'll get the inspection camera into everywhere possible and see what needs doing immediately. I really love gradually improving a used car or bike anyway - it's amazing what can be done for just a bit of time invested without lashing out loads of hard earned cash. This is definitely one for me to keep for some time - I only recently sold my XJS Cabriolet after more than 24 years of ownership. As soon as my name is on the V5, I'll request the previous owner details from DVLA to start building up a history file, but there is already quite a lot of information with it. There is a full sized spare, both key fobs and all keys and handbooks, plus there is even an empty disc magazine for holding CDs in the player, they had nearly always gone walk-about on the others I viewed. Even the warning triangle is still in the boot - and the front and rear retractable cup holders are not broken or missing. It appears that this car featured in the spoof Prime Minister Ali G film and can be seen, flanked by 'Police' outriders entering those well filmed gates at Downing Street bearing its current registration number, so that's a bit of its history already. These shots were taken when I first saw the car back in February, but the chap who wanted my Cabriolet decided after I'd viewed the Daimler that he couldn't do the deal until May because of work commitments. 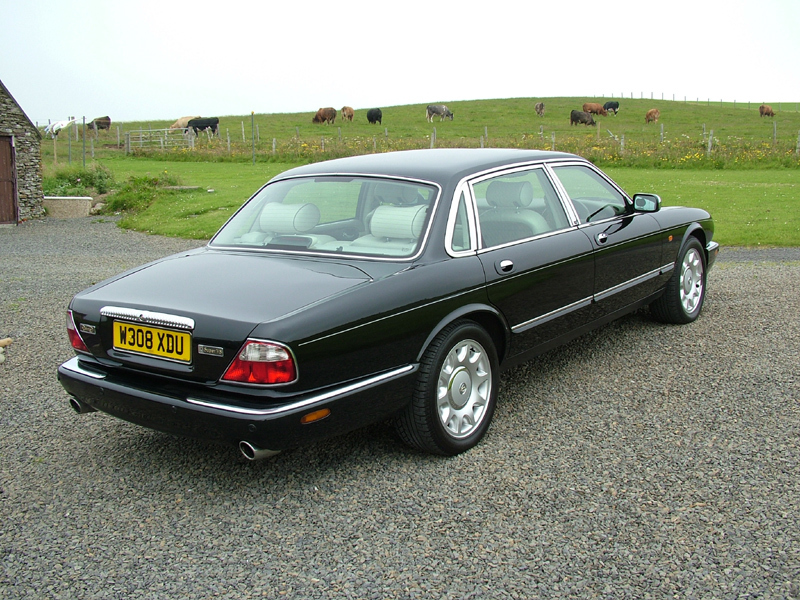 I had to give back-word on the Daimler, even though I had the money, because it would have meant that either it or the XJS would have to stand outside - not the thing to do before the Winter in Orkney had fully released its grip. I kept an eye on the advert for the Daimler and it seemed to stay put - probably too expensive for some, expecting it to be given away like most 308's. I thought that perhaps the web site had not been updated and it had long since gone. Apparently one chap, after viewing and test driving the car, glanced behind him from the drivers seat and said 'Oh! I wanted 5 seats' but I specifically wanted the rarer 4 seat version. Anyway, the Cabriolet went to Southern Ireland, but I was still too busy with other things to progress any further, although we were due to go South at the end of June to a 100th Birthday celebration, so I waited until we were on our way home from that before I rang the dealer to ask if it was still available, thankfully (for me anyway) it was. Another quicker look round it so that Christine could see it and a deal was struck. 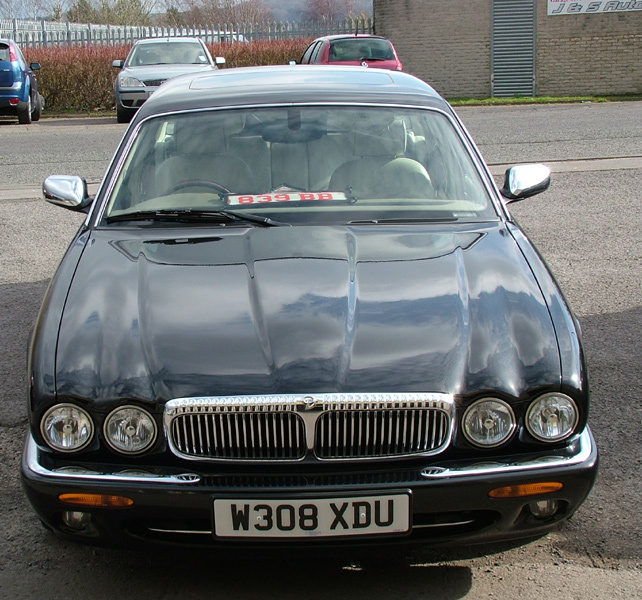 Many would say I've paid too much for it - but go and find a cheaper one in this condition with exactly the right spec! As I have no intention of selling it anyway, the price is relatively academic. These cars in this condition can only hold their own, or even go up in the future, as more succumb to tin worm and electrical or mechanical maladies which might make them uneconomical for most owners to repair. Well, the car is home now after a wonderful adventure and a visit to my Sister in Aberdeenshire to break the journey. Most of the original plan was used, except that I felt that Edinburgh would be a suitable place to have an overnight stop on the way down. Ferry and bus timetables meant that I would arrive in the Capital around 5pm. The following morning brought warm sunshine, so I walked the couple of miles from the B&B to Waverley station for my train trip to Durham. Yes, I did buy a first class ticket too! I pondered this small difference in cost during the journey and realised that having been shown to my reserved seat and with free WiFi, free food and drink, the other passengers in 'Cattle Class' were actually subsidising my journey - life just ain't fair is it? Around lunchtime in very pleasant sunshine I was picked up as arranged by Glyn, outside Durham station in a very nice red diesel S type - I'm sure he doesn't use red diesel, it was the car that was red. I enjoyed the short trip to the Garage to complete the paperwork and have a coffee before my drive North to Edinburgh. I then cruised along via Perth to my Sisters place and couldn't resist using that wonderful road from Laurencekirk over the Cairn O'Mount to North Deeside. The following day, after a lazy morning catching up on family events we had a trip out for lunch at a pub just a few miles away. The drive back on my own through the Highlands, mostly on cruise was an absolute delight and I was able to fully test most of the cars functions - and some of its performance. Coming up to a roundabout near Inverness, I manually cancelled cruise on the column and the 'Restricted Performance' warning light came on. Was it me who had confused the system by catching other buttons at the same time? Any way I pulled into the car park in the City to do a bit of shopping and as I selected reverse, the message disappeared, never to be seen again, so it might be gearbox related and will need investigating; even with the restriction, it was quite driveable in town traffic, just a tad slow off the mark (get out of my way, silly old fool in that old black car) but I will check to see if any codes have been stored. All in all a really satisfying trip in a very special car. I'm wondering if I might get a private plate for this car, perhaps a BS (Old Orkney) 4 digit number, having often been accused of talking that substance, or I could even transfer the number from my Gold Wing, which I have had for many years with 3 letters and 2 numbers. I also have an XJR number on retention which I had on an XJR Yamaha motorcycle, but it's not really an XJR is it? Then I hit on a great idea - it would be far cheaper to change name by deed poll (only about £15) to Xavier Duncan Urquhart! A Basque Scotsman? It's already got 308 in the number anyway - job done! Problem was Christine didn't fancy being Mrs Urquhart - oh well, back to't drawing board. .....and a few shots at home just after its first clean in my ownership. There are a few very minor chips and scratches to attend to and I've already got some touch up to do those. As far as I can see there is absolutely nothing which doesn't work as it did 14 years ago. I'm amazed at the condition of the wheels, inside and out! 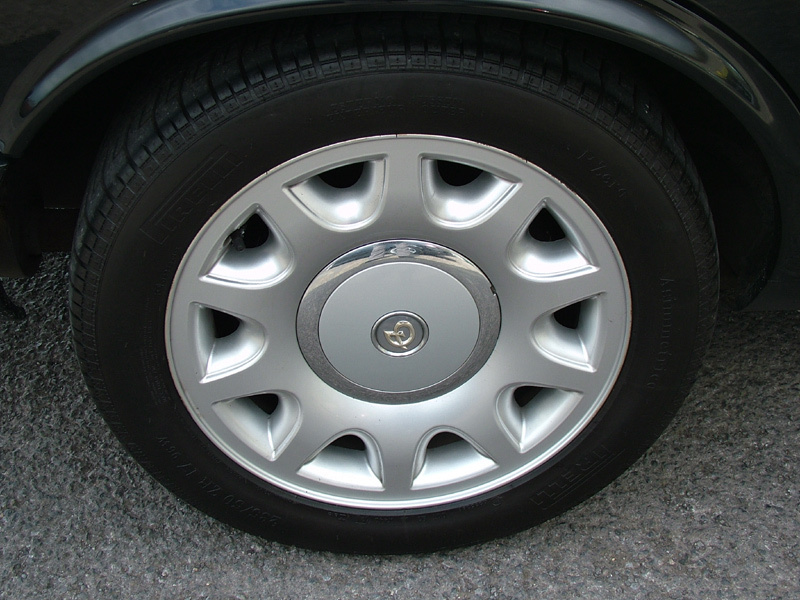 Even the full sized spare looks new. For some reason the garage where I bought it usually left the two front windows open while it was in the showroom, so the inside was a bit dusty. I have removed all of this dust and fed the leather with Gliptone, which restores the lovely suppleness and leaves it with that classic leather smell. One tiny mark on the drivers side armrest needs a quick fix with leather dye from Furniture Clinic using the code NED. I'll take it to our Annual Vintage Rally here in Orkney on 10th August with a bit of info posted.